I've been meaning to do another post on Mini Boglins for a while. 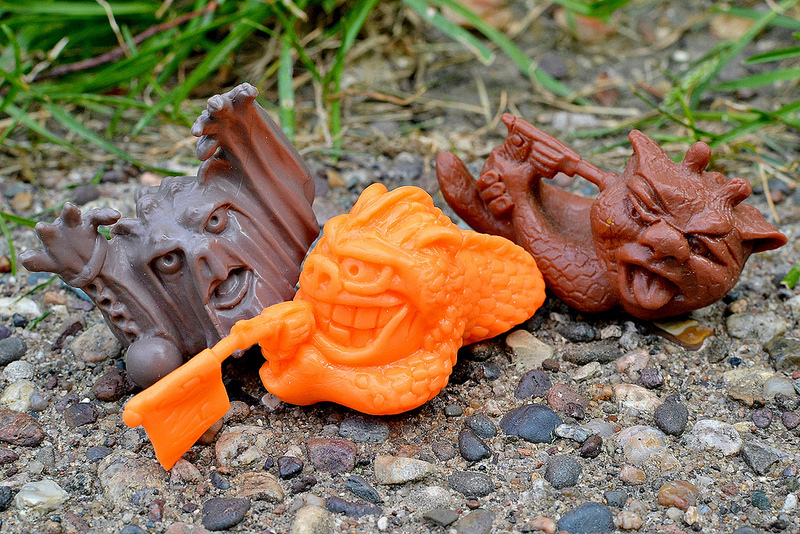 It's one of the biggest lines of "little rubber guys" ever released, but it doesn't seem to get nearly as much attention as the likes of Monster in My Pocket and MUSCLE (possibly because they were only released in a few countries). 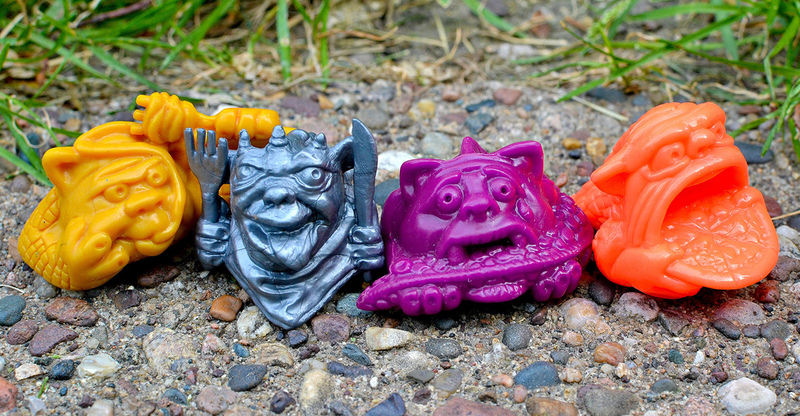 These dudes are pretty collectible, though, with a wide range of sculpts and colors to track down. 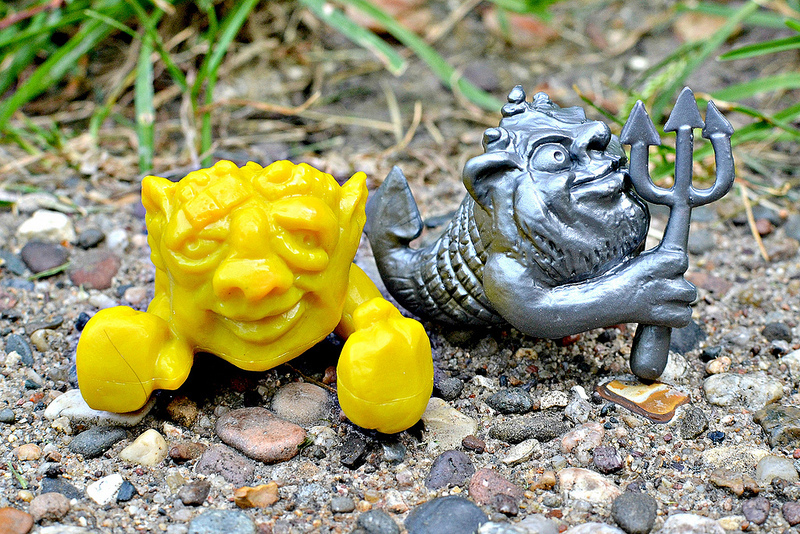 Since my original, very brief posts (here and here) on Mini Boglins back in 2012, I've added quite a few more to my collection and finally got around to taking some photos of them. 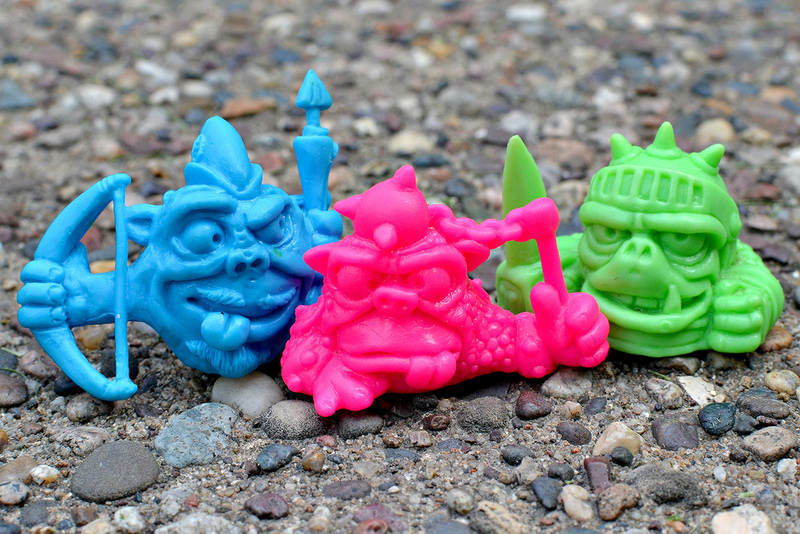 I'm not going after a full set, but I do like these figures a lot and think they look especially awesome when you put a bunch of them together into a brightly-colored horde o' Boglins! 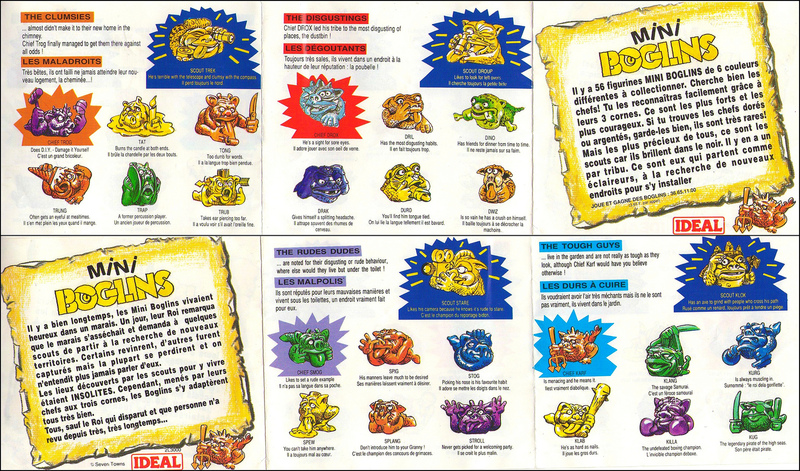 Mini Boglins were released from 1991-1994 by a company called Ideal. The Boglins characters already existed prior to their release, as Mattel introduced the larger, more well-known Boglins hand puppets in the late-1980s. They were only released in a few locations, including the U.K., Italy, and possibly Canada and/or France. Good thing I didn't know about these as a kid when they came out--it would have driven me nuts not being able to get them here in the U.S.! 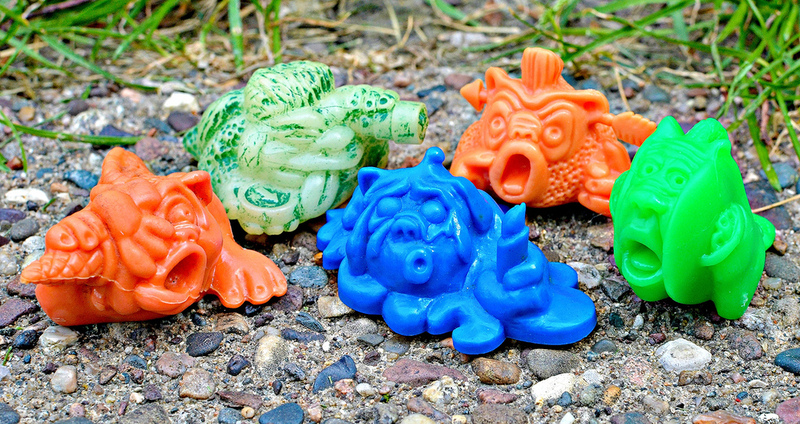 The figures are made of soft plastic with a rubbery feel kind of like Monster in My Pocket. 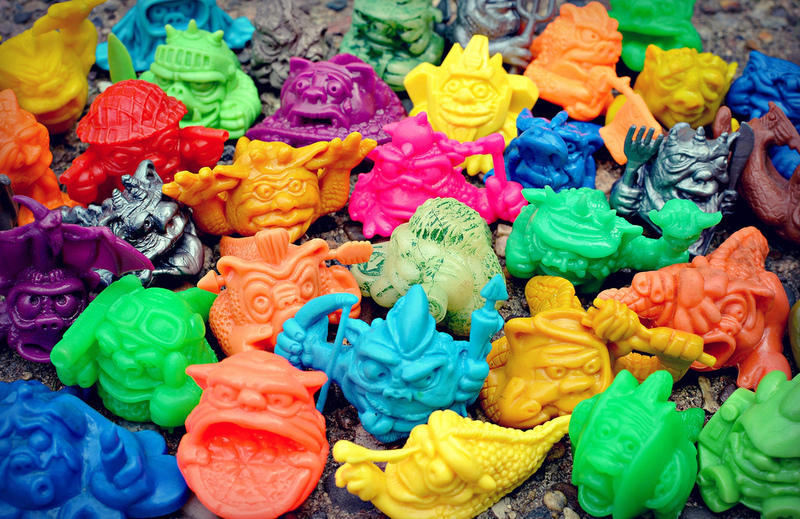 They were released in many different colors, all monochromatic except for some "Scout" figures that are glow-in-the-dark with green or purple paint washes. They were sold in multiple ways, including single-packs, three-packs, five-packs and 20-packs. The figures were separated into tribes, with each tribe featuring characters designed around a specific theme. The original tribes from 1991 included The Clumsies, The Freaks, The Greedies, The Jokers, The Rude Dudes, and The Tough Guys. In 1992, The Army Guys and The Disgustings were added. Finally, 1994 saw the addition of The Medievals, The Samurai, and The Prehistorics. 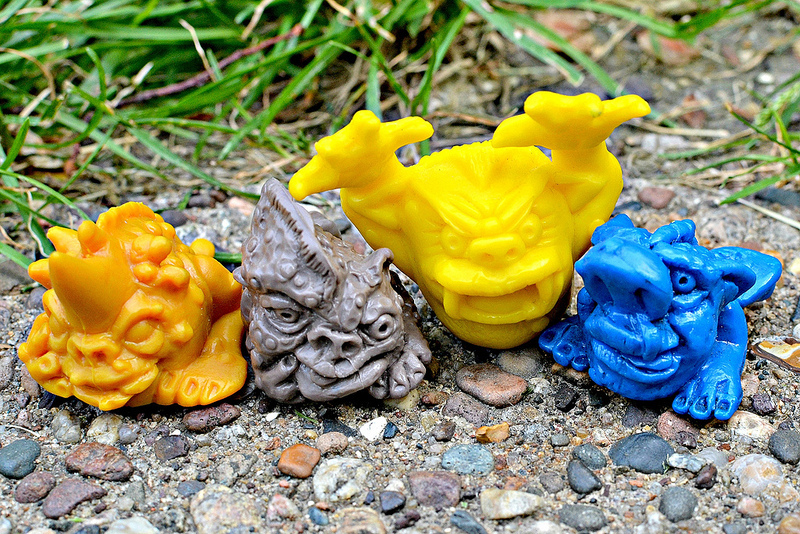 Also in 1994, a tribe of 8 slightly smaller Mini Boglins called The Cool Dudes was released as a set of premiums in Kellogg's Frosties cereal, in addition to four new "Slime" Mini Boglins that came packaged in slime-filled toilets. Check out scans above of a mini pamphlet showing details of some of the tribes. For even more details on Mini Boglins, check out The Mini Boglins Collectors Archive and the Mini Boglins post at MinifiguresXD. What do you think of Mini Boglins? Do you have any in your collection? Never even knew they made these! Seems many people aren't aware of them since they were location-specific. You should pick some up if you get a chance. They usually come pretty cheap in U.K. lots. I'm in the same boat. Who knew there was a mini version? Awesome! I need to get me some if these. That's a sweet deal, Willster! Me and my cousin used to re-enact Monty Python & The Holy Grail with our Mini Boglins, that was fun. 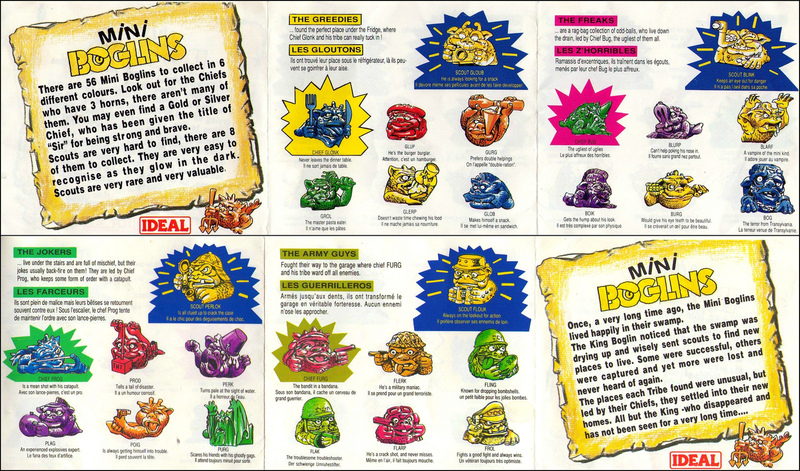 A weird thing I remember about Mini Boglins was the pricing - there was one point where there was three shops near me, all within about 100ft. of each other. One of them was selling individual Boglins for 75p, another was selling the three-packs for 49p, and yet another was selling ten-packs for 55p! My very first Mini Boglin was a dark blue version of Boik who you have there - he was attached to the front of Buster comic as a freebie, which tends to be how most of my obsessions over the years have begun. Nice! Yeah, from what I have seen there are tons to collect if you want to get all the sculpt-color combos. Pretty sure I have read that people are still actually finding color-sculpt combos that people previously didn't know existed. Monty Python re-enacted with Mini Boglins--that's hilarious! Love it. I love mini boglin too! 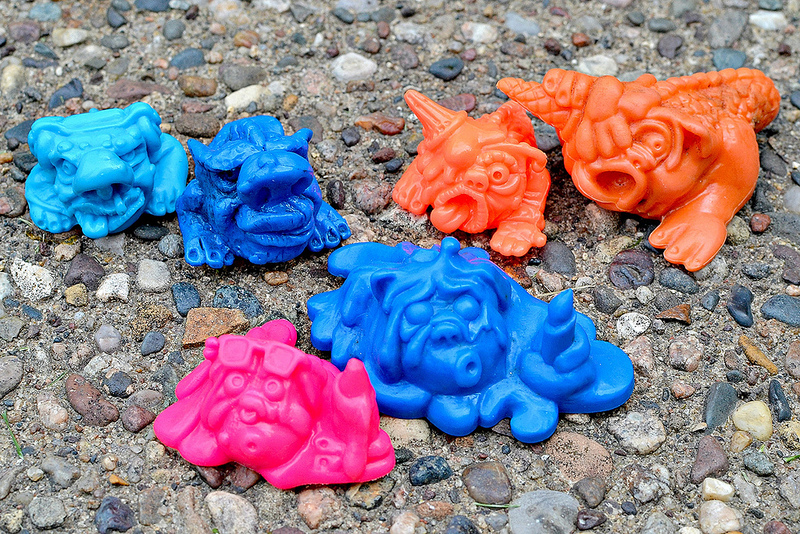 the boglins in slime are my favorite, Splurge being no.1. also very jealous of your splash! In Australia we had the sets that came out later: in slime, prehistorics, medievils and rare dudes I think. 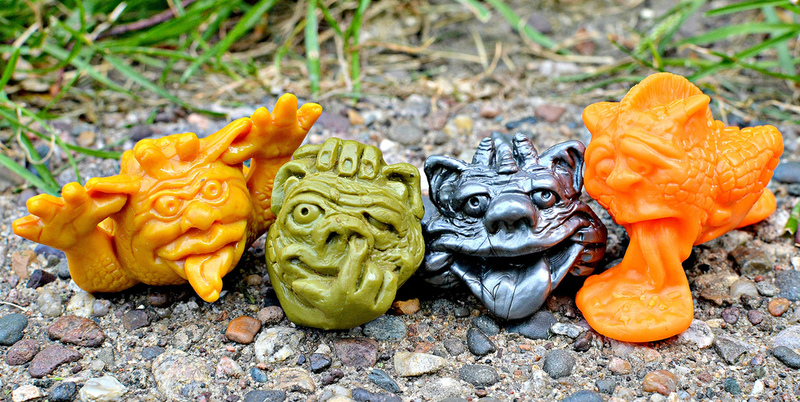 Agree about the Slime Boglins being some of the best. Splurge is one of my very favorites as well! I wasn't aware these were released in any capacity in Australia--thanks for the info! I don't think that they ever were released in Canada, or if they were it was extremely limited. I live in southern Ontario and have never heard of or seen these things before a couple of years ago. And I also don't know anyone who has heard of or seen them before I introduced them to them. I got a couple of these in a package once and I've had the boglins bug ever since. They come cheap enough, the only problem is that they're huge "mini" figures and their shipping can be insane. When I was doing research I saw one or two people on LRG mention Canada, but who knows. If they did come out there it was probably in very limited places. It definitely can be costly to have these suckers shipped from overseas. They're hefty chunks of rubber! I collected these as a kid and loved them. When we moved house to a different country my collection was lost on the way. However, I've recently completed a full sculpt set. I want to find the time to take a picture of them all. Great post...thanks. Also...boglins could be coming back. Hopefully, mini-boglins will come back too. That's great that you were able to put together a set of all the sculpts. You should definitely take a pic. I did hear something about Boglins coming back They should definitely bring the minis back too! Thanks, that's awesome! Much appreciated! Aww, you don't own any of the black spy ones? 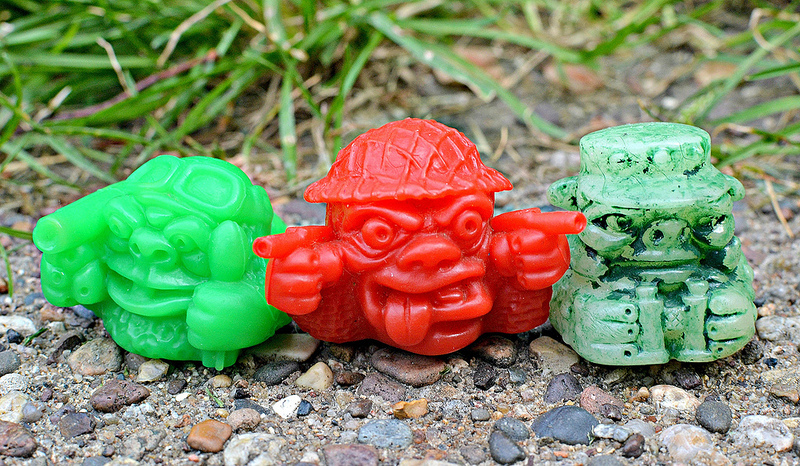 There were some really, really rare mini-boglins. During their first release gold was the most rare (I never found even one), then silver (I had maybe four), then the glow-in-the-dark scouts. During the second release the most rare was black spies followed again by the glowing scouts. I had a few, so they were never quite as rare the gold or silvers. 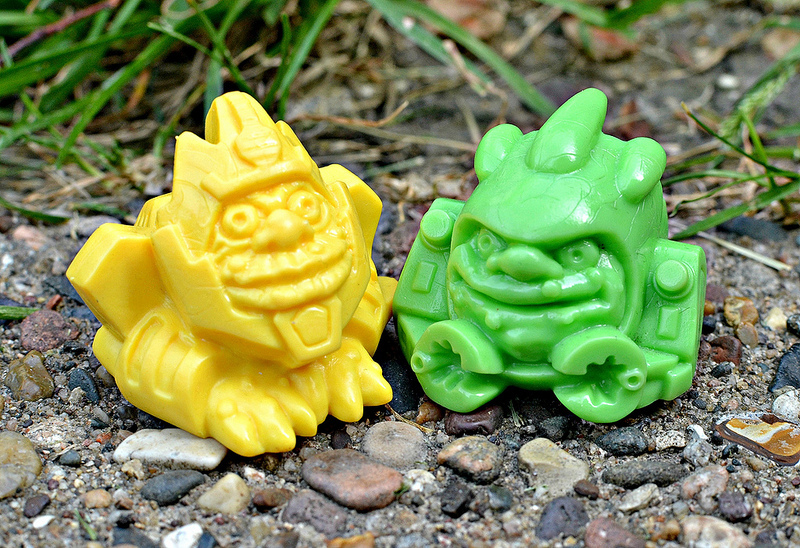 During the release of the Prehistorics and Samurai they dropped the black and glow-in-the-dark mold and none of them were all that rare anymore. Weren't the gold ones just cereal premiums? 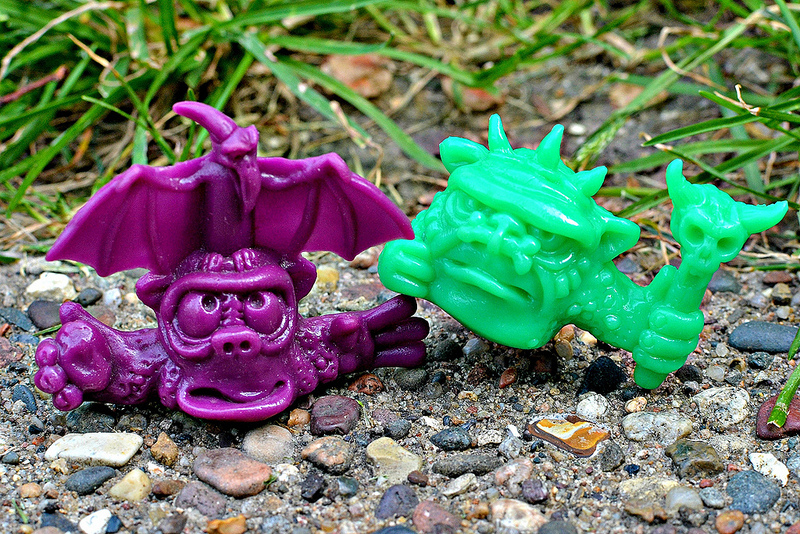 I don't collect color variations for Mini Boglins, so I don't know a lot about rare colors for that line. For years I've been searching a name for these things! I loved those little bastards (and the big ones too) when I was little girl. Today I finally ended my search with victory. Thanks to you! You're awesome! Sorry for my english, I really don't use it as much I should to keep it even understable. Yeayea, Google Translate. I did not use it. I am lazy. Sorry. I am glad this post helped you! When I came into work today I found a set of little rubber monsters in my office. They reminded me of the ones I used to collect when I was a kid. I found your blog and have been surfing all morning. Mini Boglins was one my favourite sets. And the Trash Bag Bunch. I am going to track some down online. I especially loved the ones you could put into water and see their casing dissolve. Do you have any recommendations for a recent set that dissolves like this? Can't believe they are still making rubber collectibles, they're just perfect.